Olivier Award-winner Iwan Rheon stars with Poldark's Heida Reed in the West End premiere of Dawn King’s award-winning thriller. Foxfinder tickets are available now! 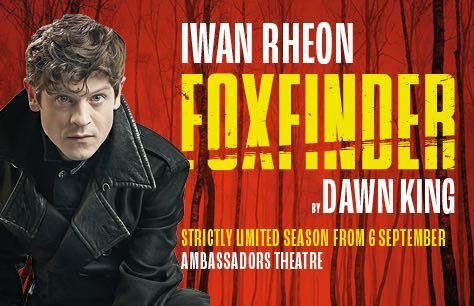 Do not miss your chance to follow Iwan Rheon on his latest hunt. Foxfinder tickets are sure to go quickly, book early to ensure the best seats at the best prices and avoid disappointment! Children under 14 will not be admitted. 13 September 2018 - 20 October 2018. Very thought provoking play. Well acted. We both loved the show! It felt like we were watching a proper story. The set was clever and beautiful, the story was gripping and the acting was second to none - felt like our own personal story book being told to us.